Skylines are what the rest of the world sees when they picture a city. It’s that first glimpse of civilisation you see when your jet cruises through the clouds. It’s etched onto postcards and embroidered onto tea towels. A city is its skyline, in many ways and with London the grand alpha city it is, it needs a distinctive enough skyline to fit the bill. On the 19th November BBC News put the word out that the already eclectic bunch of miscellaneous objects made massive are due a new member by around 2025 if the early construction predictive reports are to be believed. Londoners have already been introduced to a Walkie Talkie, a Cheese Grater, and The Gherkin and of course The Shard but now The Tulip will get its chance to make tourists gawp. Speaking of The Shard, it seems the newest London icon will be pushing for its position as the tallest building in London. The Shard will likely pip The Tulip to the post by around 3 feat if the plans are kept to exactly, with the latter coming in at a nice round 1,000 feat tall. The building itself has fluid and modern transport options for anyone who chooses to use it. The plan is to have pods, akin to those being cranked around The London Eye, only being pinged up and down the entirety of The Tulip. It will give onlookers a chance to see the city grow before their eyes before they crescendo with a view of the city that is unlikely to be beaten. Furthermore, there are plans to have slides within the building itself, not unlike those you’d see at Google or other modern workspaces. One can only assume a slide covering the entire one thousand feet of The Tulip is likely to be out of the question, though. Will it be like Arcelor Mittal Orbit Slide that we have here in London – the world’s tallest and longest slide (but taller)? Who knows. The company tasked with building The Tulip, Foster + Partners will be building it cheek-by-jowl with The Gherkin, its magnum opus deep in the financial sector undergrowth. Officially the address is 30 St Mary Axe, if anyone wanted to take a quick ‘peak’ at ground zero. 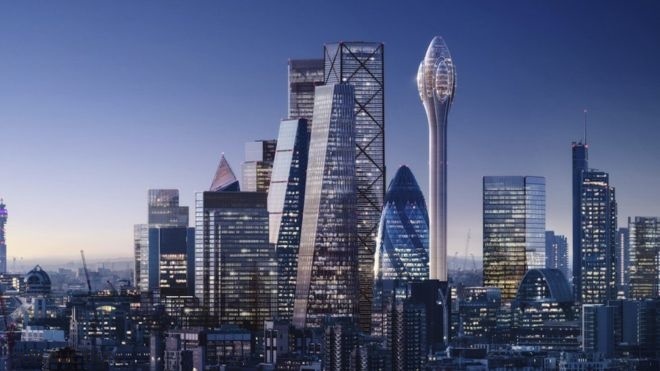 ‘The soft strength of The Tulip compliments the iconic Gherkin’ according to Jacob J Safra, whose company Bury Street Properties is funding the venture. The Job Auction feel confident it’ll make a fine addition to an already stunning skyline. Office or residential … who knows maybe one day we’ll find ourselves working inside it!